A 0.3168 Roman mile perimeter square fits tangent around Stonehenge’s 0.248832 Roman mile circumference Outer Bank and symbolizes a 31680 mile perimeter square fitted tangent around the earth’s 24883.2 mile circumference, also the Outer Bank’s 3168 Roman digit radius and 6336 Roman digit diameter refer to the earth’s 31680 furlong radius and 63360 furlong diameter. The most significant day of the year at Stonehenge is the summer solstice or midsummer’s day when crowds gather to watch the sunrise, the azimuths of the summer solstice sunrise and moonrise cross each other at right angles on Stonehenge’s parallel and this is a feature of the monument’s design that fixes the monument to this parallel. The exact position on this parallel is fixed to one tan 0.44 diagonal of the Station Stone Rectangle being on the azimuth of a great circle route to the Great Pyramid and each side of the rectangle is aligned to the above summer solstice azimuths. Stonehenge was designed to be built exactly where it is, another cosmic and global factor that dictates the monument’s position on the earth’s surface is that on the day of the Crucifixion the azimuth of the Passover moonrise and a great circle route to the Crucifixion formed the Christ Angle at Stonehenge, (the Christ Angle is the Great Pyramid’s passage angle). The 9123.84” circumference sphere is a 1 inch to 1 megalithic mile scale model of the 9123.84 megalithic mile circumference earth, this was the equator’s circumference before the bulge appeared and it turned 18247.68” per second which is very appropriately the perimeter of ½ way level at the sphere’s base. The base of the sphere above is on the centre of a 18247.68” circumference circle and resting on the centre of the 18247.68” perimeter square ½ way level. It is interesting that the 18247.68” circumference of the circle above records the equatorial rotation speed per second of the original perfect earth’s equator when it had an 18247.68 Roman league circumference, this circle is also a 1 inch to 1 Roman league scale model of a great circle of the earth. The full design Pyramid’s vertical section is an analogue of this circle but the design is very multifunctional and the vertical section is also an analogue of a quadrant of a 0.6336 Roman mile circumference circle as well as the sphere above. 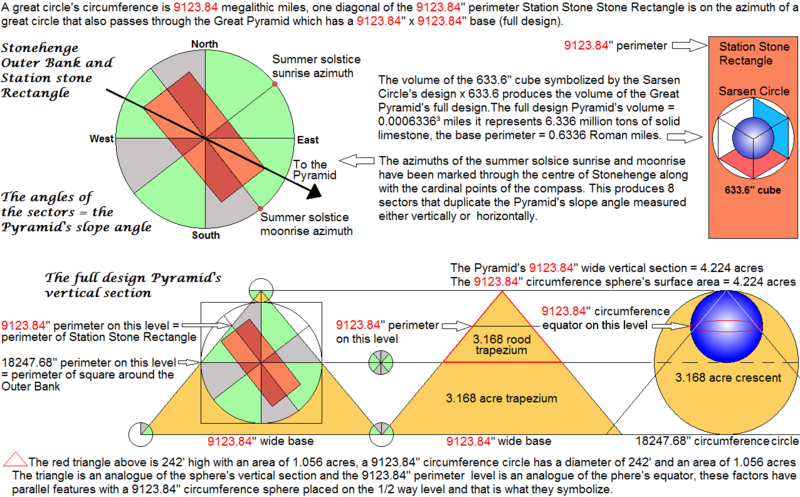 Below: The Great Pyramid’s design demonstrates the knowledge of its unique global position by incorporating it into the design, global factors divide the full design base into four 18247.68” perimeter squares and each square fits tangent around Stonehenge’s Outer Bank, the ½ way level is also an 18247.68” perimeter square. One diagonal of Stonehenge’s Station Stone Rectangle pointed the way to the Great Pyramid so we compared the relationship of the Pyramid’s full design to Stonehenge’s Outer Bank and Station Stone Rectangle which demonstrated another way in which the monuments interact and that they have the same Designer. Next we will look at a plan of the 5 squares shown above on the left with Stonehenge’s Outer Bank placed in the middle square and see how this relates to the African geographic design centred on Mount Kilimanjaro. The outer squares in the illustrations below have perimeters featuring the number 3168 and each square is divided into 4 squares that also feature the number 3168; illustration #3 is produced by combining the first 2 illustrations and illustration #3 belongs in the centre of illustration #4. Illustration #5 has a profound partnership with illustration #4 these 2 designs enclose the extremities of the Nile River inside quadrants of 1/10 scale model great circles of the earth and the moon, both designs are based on geographical features. Below we are comparing the #3 design above with the geographic design centred on Mount Kilimanjaro, the design composed of basic design factors of Stonehenge and the Great Pyramid’s full design is an analogue of the Mount Kilimanjaro design; this confirms that the designs of the two monuments and the geographic designs have the same Source. The circle enclosing the large latitude longitude design below has a diameter of 6336 miles = 3168000 reeds and a radius of 3168 miles, those 2 measurements are used as the perimeters of the 2 squares above that are centred on Mount Kilimanjaro and 3168000 reeds is also the length of one diagonal of the latitude longitude design.